it is "too",not "to".You make this mistake many times.Just remember that when it is a measure of quantity or size etc,it's "too". Some language critics have objected to the use of not too as an equivalent of not very, as in She was not too pleased with the results. In many contexts this construction is entirely idiomatic and should pass without notice: It wasn't too long ago that deregulation was being hailed as the savior of the savings and loan industry. It was not too bright of them to build in an area where rock slides occur. In these cases not too adds a note of ironic understatement. · Negation of too by can't may sometimes lead to ambiguities, as in You can't check your child's temperature too often, which may mean either that the temperature should be checked only occasionally or that it should be checked as frequently as possible. · Too meaning "in addition" or "also" is sometimes used to introduce a sentence: There has been a cutback in federal subsidies. Too, rates have been increasing. There is nothing grammatically wrong with this usage, but some critics consider it awkward. If you do "highlighting the guttersight with paint", what paint will you use. Xavier, careful about carrying Hydra-Shoks already. I had put well over 300 rounds through a new pistol, and it was feeding 165 and 180 grains very reliably. I then found that it would still not reliably chamber even the smaller weight bullets in Hydra-Shok. Even when it did chamber a few in a row, especially in manual cycling, I could always count on one to jam halfway into the chamber. I had to polish the chamber (feed ramp was not the problem) aggressively until I got reliable results. Red might not be the best choice for a highlight color as it may disappear somewhat in a low light situation. Perhaps white or yellow? You could paint some thin acetate strips different colors and lightly tack them in with rubber cement to get an idea of how the different colors work before committing to one. I don't think the new Colt Agent is a pistol I would be buying anytime soon, but I have to say that 1991a1 Compact is pretty awesome. I love the mods you have made to it and am seriously considering putting some $ into mine to replicate yours. It has not been the best pistol for me and right now is out of commission as the front sight flew off! I guess a call to Novaks will be in order. Keep up the good work Xavier...this blog is awesome! I'm fairly new to 1911s, and I've spent quite a bit of time going through your posts on them. I understand the reasons behind all of your feature preferences except for one: the ambidextrous safety. I know you don't like them, but I can't find any reason why you feel that way. I actually sought out that feature on my 1911 because I like knowing that I can easily operate the safety, regardless of which hand I'm using to shoot. Is there a technical reason for why you don't care for ambi safeties, or is it just an aesthetic thing? I dislike the ambi-safety on a carry 1911 because they increase the risk of the thumb safety becoming disengaged unknown to the carrier. I have ambi-safeties on some of my 1911s, but I don't carry those. Your argument for an ambi-safety is perfectly valid. In a life or death struggle, if I am injured and have to shoot left handed, I'll smack that safety against a wall, or other object to disengage it if I have to. Wow - how was recoil for you? I have an original Colt Commander in 'ColtAlloy' that was PAINFUL to shoot. 5 magazines through it and my hand was very sore - but my hands arent very beefy to begin with. Is this something you are used to or is it just not as unpleasant to shoot? Glad to read you bought that gun; that pistol, or something like it, is next on my list. 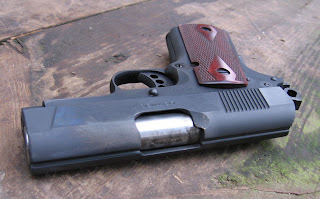 As for the uniqueness of the sight (without trying to sound like the "grammarians" who commented earlier), it's not really unique, as in one of a kind, since the in-production Kimber Ultra RCP II uses the same thing. Real 1911 fans know neither company, of course, originally developed trough or gutter sights; that honor belongs to Paris Theodore of Seventrees fame. His Guttersnipe concept originally appeared on highly modified Smith Model 39s (here's a link with more info: http://www.hmss.com/qbranch/qb0101.htm). Oops; I just re-read your post, and, of course, you're correct, as the New Agent's unique sights are exactly that among Colt pistols! I'd like to know why you find the series 80 type firing pin block superior to the Kimber Swartz Series II type firing pin block. There is no reason the Series II block can not be as reliable as the Series 80, and usually results in a (slightly) better trigger. For carry ammo, i really like the new Gold Dot Short Barrel Loads. Speer tweaked the HP cavity so that it will reliably exand at typical 3" barrel velocities. I wouldn't exactly call it painful George, but the percieved recoil was greater than the Compact. I use a very strong Chapman grip that helps tame a lot of weapons. "I'd like to know why you find the series 80 type firing pin block superior to the Kimber Swartz Series II type firing pin block." I don't Mark, I just prefer a Colt. The Series II thing of the RCPII was enough to prevent me from buying a new Kimber to get the RCP. The Series 80 thing was not enough to prevent me from buying a new Colt to get a New Agent. 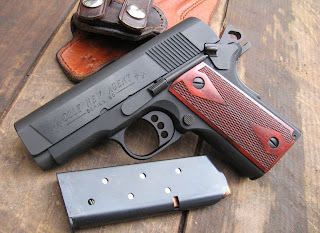 I haven't examined a Kimber Series II FPS closely enough to even say. The real issue was with Kimber's external extractors, which the RCPII doesn't share. Like I said, i lusted over it, but i never made the leap. Had I found one used for an attainable price, I may have bought the RCPII. The EE was a thankfully shortlived abomination that had a lot of problems. These days Series II just means Swartz type firing pin drop safety. I have 2 Kimbers and 2 Colts. All 4 are excelent pistols. At the end of the day, I find that my lower back is much happier if I have been carying an alloy frame rather than a steel frame. Those oz add up. xavier, you should be range testing new colts provided to you free from the factory...the interest you have created in this new model alone will certainly result in increased sales. exceptions would be pieces that had a lot of shooter-specific mods; they might have spent hundreds for customizing, but that money rarely comes back on resale. again, though, if somebody forwards your blog to colt, you might expect some freebies to write about! Jack, the big difference between the Colt Series 70 vs Series 80 is a firing pin safety. The difference between the Kimber Series I and Series II is a different style of firing pin safety and an external extractor on the early Series II's. Is there any trickery that can be easily performed to increase accuracy as you have mentioned with some of the 1911's, such as changing bushings or anything of that sort? I'm uneducated as to whether it's possible with this pistol. I don't think so. The New Agent is a bushingless pistol, so a tighter bushing is not possible. The clearances could be tightened up through welding and resurfacing, but then reliability would likely suffer. I would prefer reliability. Reliability on this Colt New Agent has been 100%. Today, I shot another 100 trouble free rounds. Accuracy is sufficient. Did you paint the rail sight? If so, how do you like it? What color and type of paint did you use. Or if anyone has done so, please post your experience with the painted rail. Can the New Agent be alter to accomidate traditional sights or maybe even low profile novaks? 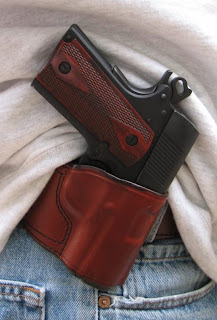 I carry a Commander size Springfield and sometimes the weight is an issue if I going to out all day, it seems the New Agent would be the perfect size, weight, and caliber for my daily carry needs. Anon, in that event, a Colt Defender might be a more appropriate pistol. It's the same lightweight pistol, but with a stainless slide and the later models come with Colt's version of the Novak sight. The price is about the same if not less, and it has a great track record for reliability. Screw on some slim grips and Bob's your uncle! Xavier, long-time lurker here...I thought Colt stopped selling handguns to the civilian market? "Xavier, long-time lurker here...I thought Colt stopped selling handguns to the civilian market?" They may have Curtis, but Colt Commercial (Colt's division for commercial sales) certainly sells a lot of pistols (every one they make) to distributors and dealers to sell to the civilian market. What you heard was a rumor that goes around often, and is often spread by Kimber dealers who can not get Colts. "and is often spread by Kimber dealers who can not get Colts." Heh. That's good to hear, because I loves me a 1911 and I like Colts (among others), so I will definitely be on the lookout for a New Agent. Several times I've seen it mentioned that Kimber quit using external extractors a few years ago but I just purchased a Kimber Rimfire Super pistol made on 10/01/07 and it has an external extractor . Am I missing something , when I ordered it I didn't even think of external extractors since I thought it was a moot point . Will Kimber replace it with an internal extractor ? Any info will be appreciated . Contact Kimber to find out. I like the looks of the gun, but I prefer a conventional sighting system and a metal mainspring housing. The checkered front strap is nice. 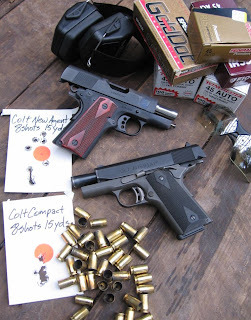 What is the difference between a series 80 and a series 90, as the colt new agent is marked series 90? The Series 80 and 90 share the same firing pin safety. The difference is the lightweight frame and bushingless slide of the Series 90. In reference to the gutter sights on the New Agent, forget about sights. This handgun is designed for one purpose, a close quarter, conceal carry defense weapon. In a close quarter, milli-second, high stress shooting (any shooting), 95% plus will forget that their weapon has sights. Train with the New Agent using the fast reaction, close quarter (15 meters or less)point shooting techniques and you might be pleased with the results. xavier, I wonder if you could tell me at what range you were shooting at the paper in that picture that shows those groups! Have you though of epoxying a fiberoptic rod in the muzzle end of the trough. I think it would look like a dot front sight in a U shaped rear sight. With all the different diameters and colors available it seems more logical than painting the trough. Just found this sight this morning and really enjoyed the information. This past Sat a friend and I just picked up our new Colt New Agents, it had taken the dealer a couple of weeks to come up with a pair of them.We got the 9MM instead of the 45. When we got them home we started shooting. They were a hoot. Take a little getting use with the lake of exposed sights, but that can be overcome. We also worked on drawing and shooting in short quarters ( not using the sight channel) again was pleased with the guns reaction. My friend had some trouble with the low and to the left, but will try grip and finger placement as was previously mentioned. The thing I found was the trigger pull. I have a 9mm Springfield that has a long trigger pull the New Agent is short and sweet, but the second shot can come quick. The guns did cost more than others we look at but didn't think we could go wrong buying Colts. I is definitely my carry gun. I own a stock New Agent and really love it. The low drag sighting system is a blessing. And for a potentially rough and tumble gun I like that it has the series 80 firing pin (can't feel creep from it either). I added crimson trace grips and all my accuracy problems faded fast. Target acquisition was instantaneous. A bit pricy but my worries were justified by the holes I shot before the laser! As far as I am concerned, Colt nailed this one with an SA CC...except for one major issue/turn-off. The grip safety (and I know there are critics out there that claim they are not really an issue). Since no one can forsee what will actually go down in a pistol fight, the grip safety may come into major play. Don't need it, don't want it. Because of this I will not own one. Simple solution, remove the grip safety from the 9mm SA version, and I'm first in line to pay $900 for this gun...till then...CZ still has my attention and devotion. Xavier, or anyone that knows anything about the two) I have a sig sauer ultra compact 45 (two tone) that I am seriously considering trading for the new agent. This will be my every day carry gun. Is this a good idea? Also I've seen more bad than good reviews on the new agent but I'm still not deterred. I've held one but never shot it. I really can't make up my mind if this would be a smart move or not. I would really appreciate it of you would give me your thoughts on this. As for anyone else who would not mind giving their opinion, please be unbiased and truthful. Not to sound corny but this could be a matter of life or death. Love my new Agent in 9MM. Changes I made to the gun. Thick custom snake wood grips for my large hands. Wilson Combat magazines. Flat wire recoil spring, rod and plug install from a S&W compact 45. A nice trigger job that breaks close to 3 pounds. 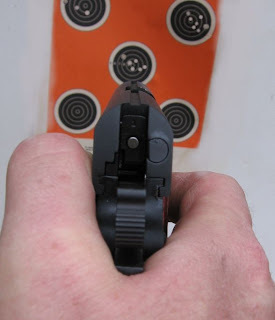 Reliably Shoot something small at 25 yards or put a nice group on a target at 15 drawn from a holster. HARD TO BEAT A GOOD 1911 Trigger..:)!